Tired of the “one size fits all” approach to math instruction? Discover the alternative! Transform your classroom with Math Workshop, the balanced, student-centered approach to learning characterized by daily routines and centers. Math workshop provides an effective environment for developing lifelong mathematical reasoning skills. 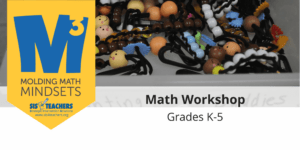 Participants will learn the key elements of an effective math lesson, the importance of daily use of manipulatives, and how to integrate game-based learning into current instructional practices. The result is instructional time that is focused, engaging, and full of opportunities for practical application of skills being taught. Participants will also leave with a variety of math games that can be easily differentiated and support the Common Core State Standards. Download PDF of Event Flyer. Copyright © 2019 Strategic Intervention Solutions, LLC. Don't miss a thing! Sign up now to receive the latest blog posts, news and updates from SIS for Teachers!